MacBook Air–Review and Pricing ! 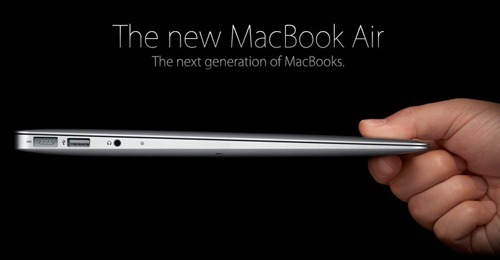 MacBook Air – Is it really that airy? Here is quick review, specs and pricing of the new Apple Launch – The New Apple MacBook Air. The reviews for this new little puppy have been far and wide – and mind you, not all have been impressed. Many of them have called hailed it as excellent, while others have called it Underpowered. While some are impressed with its low pricing, while others think it is overpriced. As it usually happens Steve Jobs was excellent at his key note address – He is always impressive ain’t he ? MacBook Air comes in two flavours, 11.6-inch and 13.3-inch LED backlit screens sporting Intel Core 2 Duo processors running at 1.4GHz and 1.86GHz respectively. It is .68 inches thick, at thinnest .11 inches, and weighs 2.9 pounds. The 12-inch model has 7 hours of claimed battery life while the 11-inch model gets 5 hours of battery life, with 30 hours of standby time on both. The 11-inch model will be available at $999 and $1,199 for the 64GB and 128GB models and the 13-inch model is priced at $1,299 and $1,599 for 128GB and 256GB models respectively. This is first time ever that an Apple PC is costing less than 1000 dollars, which is great because now it is affordable to many more consumers. So what is your take? MacBook Air – A hit or a miss ? Toyota pins hope on low cost Etios to capture Indian Car Market Share! Commonwealth Games Corruption – Its Time to Ask Harsh Questions ! Top Tech News Today: Realme C2 Launch, PUBG Ban, Google Pixel 3a, and More! You did review of Nokia Booklet 3G a while ago. Put these notebooks side by side and you’ll get proper vision of the product offered by Apple. Nokia Booklet 3G can have HDD replaced with Intel X18-M 80Gb SSD for $230. After such upgrade notebooks are much more comparable. I’d appreciate if you publish the comparison including release dates for both products.